As a general rule, it is best to leave baby birds alone. A baby bird has a greater chance of survival in the wild than it has being hand-reared by man as they learn to fend for themselves and how to forage for food by their parents. Around 2 weeks after hatching young birds in your Bailiwick garden usually leave the nest, just before they learn how to fly. It is about this time that you find a young bird out of its nest, as it is probably a fledgling. Fledglings are almost fully feathered, able to walk, run and hop on to low branches, and will try to hide in undergrowth where they are fed by their parents. Parent birds are not usually far away and are probably collecting food but will not return until you have gone. Within a day of leaving the nest, fledglings can usually fly enough to keep up with their parents and escape predators. Please remember to only move them, or encourage them to move, a short distance to safety if they are in immediate danger. If you have picked up a fledgling, put it back as near as possible to the place you found it. Don't try to return a fledgling to its nest as you may disturb other young birds. If you are concerned about its safety try to put it nearby on a ledge, or somewhere it will be out of the reach of cats. You may want to use an ice cream container with kitchen towel in and place it in a tree or ledge. Monitor the situation from a place where you will not been seen or heard as otherwise you may continue to discourage the return of the parents. Do this for at least two hours. You will almost certainly find that the parents have taken care of their youngster within this time. If, after monitoring, you think a fledgling is genuinely orphaned or sick please call the GSPCA on 01481 257261 and choose the emergency option or bring it to the Animal Shelter where we have hospital cages set up ready for them. Please do not try and care for these birds yourself. If you need further help and advice, again please call us on 01481 257261. 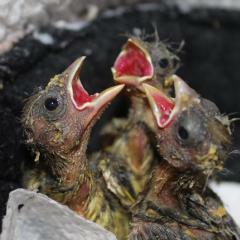 Nestlings are baby birds that only have a small number of feathers. They are different from fledglings in that they are totally dependent on the security of the nest and will not fare at all well if left. If a nestling is found, contain it as soon as possible in a warm, dark, well-ventilated cardboard box (do not offer water, milk or food as this could make them ill or if done incorrectly worse). If the bird is sick, take it to your nearest veterinary surgeon or to the Animal Shelter or call 01481 257261. Never try to return nestlings to their nests as this may disturb the other babies. 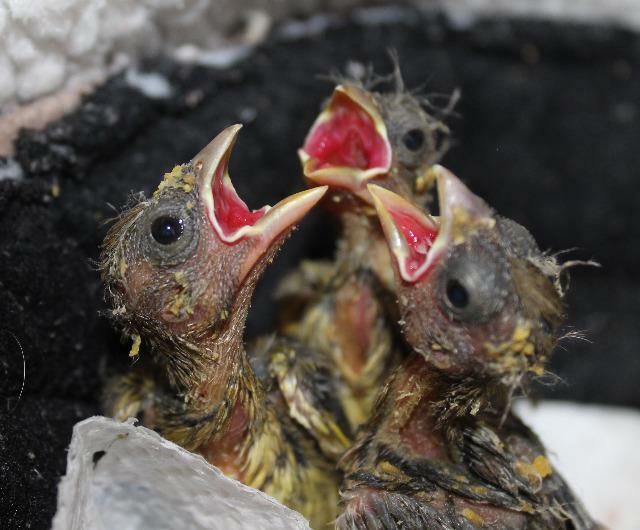 Never try to rear nestlings yourself, as they need specialist care if they are to survive and the staff at the GSPCA have years of experience and training. Please remember handling any animal either domestic, wild, dead or alive may be potentially hazardous. Obvious dangers include bites, scratches and general hygiene issues. The GSPCA advise common sense should be applied in all instances and if unsure please call 01481 257261. Personal hygiene should be taken into consideration after handling any animal whether it is domestic, wild, dead or alive.